When it's done, this 1968 Ford Mustang will melt faces... if it doesn't explode first. 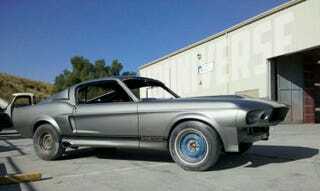 The above Mustang looks like your typical in-progress restoration of a GT500 Eleanor clone. That is, until you see what's going to power it. Sitting between the fenders is forced-induction insanity melded to cubic-inch goodness.